The economy is slowing and macroeconomic policy is becoming more supportive. However, enterprise debt is very high and local government finances are stretched. Avoid directing credit to state-owned enterprises and local governments as part of the fiscal stimulus. In many provinces, public debt exceeds total annual revenues, in some by a large margin. Link debt ceilings to sub-national government revenues. The exchange rate can move within a 2% range relative to the previous day’s closing rate, and the move of the currency basket overnight and the so-called counter-cyclical factor. Explore steps towards greater exchange-rate flexibility, starting with making its formation mechanism transparent. Monetary policy rules appear to have attached a greater weight to inflation in the past decade and a half. Establish a framework to move towards inflation targeting in the medium term, including the re-assignment of tasks among agencies. A series of general import tariff cuts in 2018 reduced the overall average tariff level, but trade barriers, in particular non-tariff barriers are still high. Continue lowering import tariffs and dismantle non-tariff barriers. Numerous market entry barriers and restrictions on the business conduct of foreign firms continue to apply, discriminating against foreign companies and preserving an uneven playing field. Recently announced relaxations on entry restrictions for foreign firms aim at making it easier to access the Chinese market. Dismantle restrictions on the entry and conduct of foreign firms, in particular requirements to form joint ventures or transfer technology. Intellectual property right violations hinder innovation and the entry of foreign technology firms. Strengthen intellectual property right protection by more systematically prosecuting violators and raising fines. Corruption is still widespread, notwithstanding the various initiatives to fight it. Enhance transparency and accountability and reduce the concentration of power in managers’ hands. China should sign up to the Anti-Bribery Convention. Chinese ODI is soaring and infrastructure projects risk imposing a heavy debt burden on several countries. China should adhere to the OECD Declaration on International Investment and Multinational Enterprises and Chinese companies operating overseas should follow the OECD Guidelines on Multinational Enterprises in their business conduct. Infrastructure projects should be subject to thorough cost-benefit analysis and take into account the indebtedness of the recipient country. Real economy developments are hard to follow owing to a lack of publicly available data on many key variables on an internationally comparable basis. Similarly, incomplete or tardy general government data hamper fiscal policy assessment and the lack of information on overseas affiliates inhibits the gauging of such activities. Improve the quality, coverage and timeliness of data releases, in particular basic National Accounts and fiscal data and follow international standards. Data should also be published in real terms on a timely basis. State-owned enterprises and other public entities enjoy implicit guarantees and other forms of preferential treatment. Ensuing problems include corporate debt inflation, distortion of credit allocation and excess capacities in several industrial sectors. Gradually remove implicit guarantees to state-owned enterprises and other public entities by allowing them to default. Apply the competitive neutrality principle when dealing with SOEs. SOEs have large market shares in many sectors. Reduce state ownership in commercially oriented, non-strategic sectors. Good quality resources in major public services such as education and health are highly concentrated in the largest cities. Access to public services is linked to one’s household registration or hukou. Distribute more evenly high-quality education and health resources to reduce incentives to move to mega-cities. Gradually ease restriction on access to public services for non-hukou holders and delink it from the hukou. The county level is in charge of education, health and other key public services, but relies heavily on transfers and often faces unfunded mandates. Centralise the financing of some key spending items, such as wage bills in education and health. Social security contributions are a high burden for the low-income earners as they pay according to 60% of the average wage and highincome earners three times of it. Abolish the floor and raise the ceiling for social security contributions. Income and wealth inequalities are large. Few people are subject to personal income taxes. The equalising impact of social assistance programmes is negligible. Widen the base of personal income tax and make it more progressive. Introduce a recurrent tax on the holding of real estate and an inheritance tax. Target social assistance programmes better to the needy. Pollution is taking a heavy toll on human lives. Environmental data falsification or manipulation at the surveillance facility is rampant. Enforce regulations more strictly, raise fines for polluters, and raise environmental tax, in particular on fossil fuels. Halt the construction of coal-fired power plants. Investment in the treatment of environmental pollution has been stagnating and access to sanitary facilities in rural areas is limited. Increase investment in pollution treatment facilities and environmental infrastructure, in particular urban water treatment and environmentally harmless rural sanitary facilities. Growth is slowing down and is rebalancing towards consumption and services. Catching up with OECD economies continues despite slowdown. 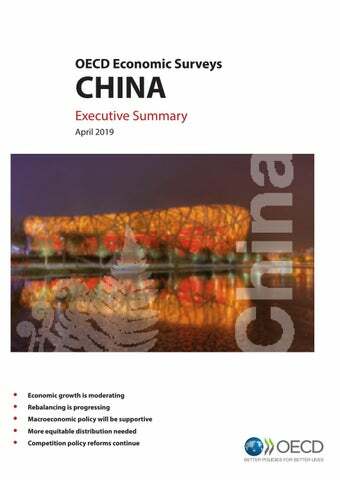 China contributes about a quarter of global growth. The economy continues rebalancing on the back of steady consumption growth. 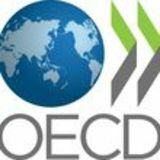 Difficult challenges remain, however, especially the high level of total debt, which exceeds that of many OECD countries. Consumption has been supported by low unemployment and steadily rising incomes. Households are spending increasingly on items such as e-commerce and shared services. As the labour force has been shrinking for a number of years, reflecting population ageing, labour shortages are keeping wage growth high, particularly in large inland cities. Source: OECD Economic Outlook database. Even though it is slowing down driven by structural factors such as shrinking of the working-age population, economic growth remains robust by international standards. Slowing investment is behind the recent slackening of growth. Excess capacity in a number of industries weighs on business investment. Government restrictions on mortgages have contributed to housing prices levelling off in the largest cities and have curtailed real estate investment. Infrastructure investment has also weakened, as local governmentsâ&#x20AC;&#x2122; borrowing has been reined in. To allow better assessment, investment and other basic National Accounts data should be published also in real terms and on a timely basis, following international standards. Continuing trade frictions and the weakening global economy are undermining exports and creating uncertainties. The impact of trade tariffs is concentrated in processing and other export-oriented and importdependent industries. Small and medium-size enterprises are disproportionately affected. Reflecting uncertainties, share prices have sharply declined, partly recovering thereafter. A further escalation of import tariffs faced by Chinese exporters would have an even more severe impact on activity, jobs, and corporate earnings. Source: CEIC database and OECD projections. Corporate debt is higher than in other major economies. Excessive leverage and unsustainable levels of debt in the corporate sector imply financial risks. Corporate debt is higher than in other major economies, though urban construction-related debt by local government investment vehicles also belongs here, while in other countries it would show up as government debt. Infrastructure stimulus could lift growth over the projection horizon, but it could lead to a further build-up of imbalances and capital misallocation, and thereby weaker growth in the medium term. Some local governments are heavily indebted. The debt quotas therefore need to take into account repaying ability of the issuing local government. Source: Bank of International Settlements database. Digitalisation is expanding fast, but raises concerns. Digitalisation provides a leapfrogging opportunity, which Chinese firms and policy makers have been swift to seize. China has become a world leader in e-commerce, online payments and the sharing economy. Regulations lag behind the expansion of the sharing economy, raising environmental and security concerns. The widening of the digital divide needs to be remedied. Stronger basic literacy and computer skills and affordable internet services country-wide would help more people to benefit from digitalisation. Source: European Commission 2018 PREDICT Dataset. Growth needs to be more equitably distributed. The benefits of growth have been more widely shared in the past decade, but more needs to be done. Personal income taxes made only a small contribution to redistribution and with the recent reforms they increase inequalities. The redistribution capability of the system should be strengthened by widening the tax base. Eliminating the minimum social security contribution, which is required irrespective of income, would alleviate the burden on low-income earners. The retirement age should be raised to make the pension system sustainable. The transfer system, including the minimum living allowance, the dibao should also be more redistributive by better targeting. Source: CEIC and OECD Revenue Statistics database. Pollution is taking a heavy toll on human lives. Pollution should be reduced below harmful levels by raising environmental taxes and fines for polluters as well as investing more in pollution treatment facilities. One priority is to halt construction of new coal-fired power plants. Source: Price Supervision and Anti-Monopoly Bureau, NDRC.